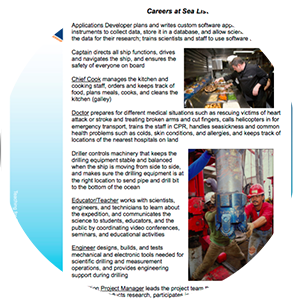 Actvity Summary: In this activity students explore the diversity of careers aboard an ocean research vessel called the JOIDES Resolution to learn how the skills and expertise of each individual and the teamwork of the group are essential to the success of the science. Students read brief descriptions about the many jobs represented on the ship, then choose one job of interest. Each student then shares a summary of the work duties associated with their selected career with the class. With everyone in a circle, one student, holding the end of a ball of yarn, tosses the ball of yarn to a shipmate that his/her work affects. This process continues until a web of yarn connects everyone that works on the ship. Through observation, discussion, and manipulation of the web of yarn, students learn several important aspects of doing science: many different jobs are involved either directly or indirectly, teamwork is essential, and jobs and work are multi-disciplinary and valuable.